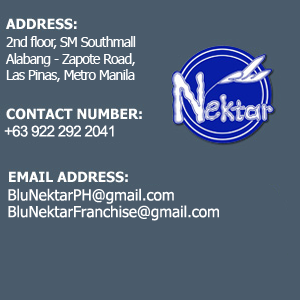 We are Blu Nektar Philippines Franchising Information Section! In order to progress through our Franchise Application, we need you to complete the following a questionnaire to assess your qualifications as a potential franchisee. Please send us an email through BluNektarFRANCHISE (@) gmail (dot) com or send a line through the Contact Form below and we will immediately send you our Welcome Packet that includes our Franchise Package and our Franchisee Application Questionnaire.